It’s been over 10 years since New Hampshire deregulated electricity in the state, which opened the markets for alternative electric suppliers to generate electricity for residents and business consumers. The intended effect was to use a competitive market to help drive down the cost of energy. So far, both officials and consumers consider deregulation a success in New Hampshire. 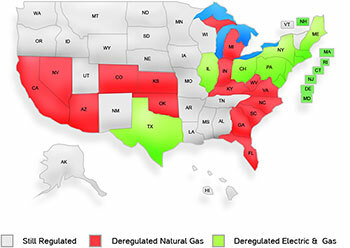 WHAT IS THE HISTORY OF ENERGY DEREGULATION IN NEW HAMPSHIRE? In 1996, the legislation directed the New Hampshire Public Utilities Commission to develop an electric choice program that could be implemented by 1998. The Public Utilities Commission completed their plan by 1997. The Granite State Electric Company restructured and offered electric choice in 1998. The Public Service Company of New Hampshire, which services 70% of retail consumers in the state, restructured and offered New Hampshire business and residential consumers retail choice in 2001. Unitil Energy Systems restructured and offered electric choice in 2003. Once Unitil Energy Systems restructured and offered electric choice, the deregulation of energy was complete across the state. HOW MANY CONSUMERS IN NEW HAMPSHIRE TAKE PART IN THE ELECTRIC CHOICE PROGRAM? Aggressive marketing by alternative energy suppliers has largely focused on the big business and industrial customers. Some residents aren’t even aware that they have the option to choose a new electric supplier. A low number of alternative electric suppliers entered the market in the beginning stages of electric choice. That’s changed now, and the more competitive atmosphere has created more favorable electric rates for New Hampshire businesses and residents. However, experts and analysts expect tens of thousands of consumers and businesses alike to switch in the coming years, as more suppliers enter the market and help drive down the electric rates. HOW DO NEW HAMPSHIRE RESIDENTS AND BUSINESS OWNERS TAKE PART IN ELECTRIC CHOICE? Step 1: Compare alternative electric suppliers in New Hampshire. You can compare alternative electric suppliers by going to http://www.puc.state.nh.us/Consumer/energysuppliers.htm(Michelle, switch this to your link if you add Ohio to your site). There you’ll find a list of the electric suppliers as well as what territories they serve. Take note that some suppliers only serve business customers. Step 2: Choose a new electric supplier that meets your needs. Just choosing an alternative electric supplier doesn’t automatically lower your New Hampshire electric rates. You need to compare rates carefully to find the supplier which meets your needs. Will you be given a limited-time promotional rate? If so, what will your rate be once the promotional period as expired? Is there a penalty for terminating a contract early? Will you be paying fixed rates or variable rates? Step 3: Initiate the switch. Once you’re happy a supplier and their terms, then you can initiate the switch. You do this by informing your new supplier that you’d like to switch. They’ll inform your local utility company, who’ll seamlessly make the switch without any disruption to your service. While your electric supplier will be different, everything else remains the same. Your local utility company will still deliver your energy, bill you, handle customer service, and build and maintain the infrastructure. New Hampshire residents and business owners agree that energy deregulation was a great choice for the state. See if you don’t agree too by researching your options today.